We offer products from all of the major manufacturers. 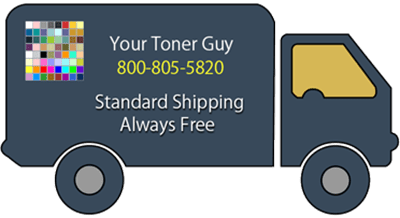 Your Toner Guy’s product line includes supplies for copiers, inkjet printers, laser printers and fax machines. Your Toner Guy’s offering of compatible supplies for over 20 equipment brands is one of the most comprehensive in the industry encompassing: inkjet, laser, MICR, maintenance kits, copier, and facsimile products. We stand behind our products. All of our compatibles meet or exceed OEM standards. All of our products are backed by our NO QUESTIONS ASKED guarantee. If a product fails, we will replace it - No Questions Asked! Special orders don’t upset us! We love a challenge. Don’t see an item, device, or manufacturer in the table below? Just contact us. LaserJet toner cartridges, inkjet cartridges, maintenance kits, MICR, ribbons Copiers, laser printers, inkjet printers, fax machines, cash registers, data storage products, thermal printers Brother, Canon, Copystar, Dell, Epson, Gestetner, HP, IBM, Imation, Konica-Minolta, Kyocera-Mita, Lanier, Lexmark, Muratec, NEC, OCE, Okidata, Panasonic, Premium, QMS-Minolta, Ricoh, Royal Copystar, Samsung, Savin, Sharp, Sharper Image, Toshiba, Trend, Xerok-Tektronix, and more.